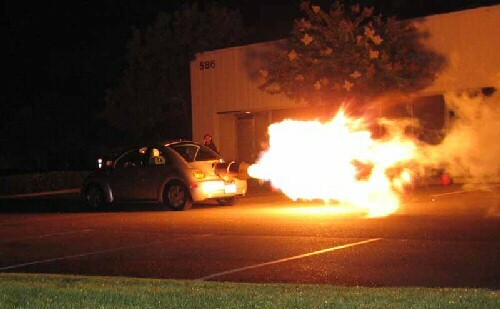 This is what happens when you bolt a jet engine on the back of a VW Beetle. On the interesting grounds that it hadn’t occured to anybody that somebody might want to do this, there is apparently nothing illegal about it in California, so the car is street legal. The owner provides helpful illustrated summary instructions on how to build your own, noting in passing that you should avoid running the engine above 650°C. His worry is that there is then a risk of damaging the engine. The opinions of his neighbours are not recorded. The scooter on the web page looks a little underpowered.